Lady and the Blog → Living → technology → Make The NeatDesk® and NeatReceipts® Part Of Your Spring Cleaning Routine!! 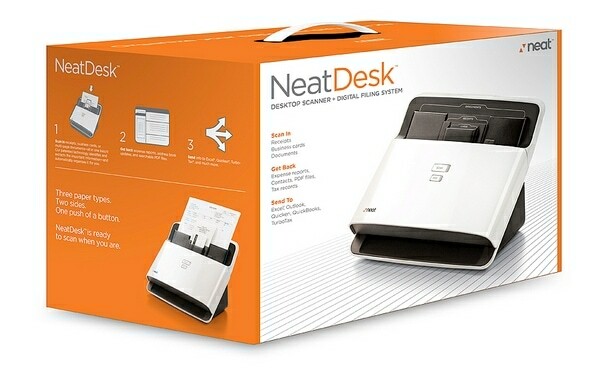 Make The NeatDesk® and NeatReceipts® Part Of Your Spring Cleaning Routine!! Springtime is quickly approaching and before the temperature starts to warm, there is no better time for you to get your homes clean and organized. My house is typical a disaster – especially with receipts. Bill and I run an at-home business, so everything has to be tracked. Usually, we hardly ever get around to it – which means piles and piles of chaos in the kitchen. Had the chance to chat with certified professional organizer, Monica Ricci and she offered up some of her tips and tricks for straightening up paper clutter with The Neat® Company’s digital filing system solutions, NeatDesk® and NeatReceipts®. HELLO! How exciting!!! So, what is Neat? Basically, it’s a machine that scans, organizes, and stores important documents. Through magic (ok it’s called optical character recognition (OCR) and parsing technology), Neat’s digital filing system creates a keyword searchable database making it easy to retrieve important household files. So, we’re not just scanning – we’re organizing! Users can start by archiving important documents such as: medical documents and insurance forms. Manage finances by scanning receipts and creating household budget reports. Select tax deductible items and save for tax returns or export files directly to TurboTax®. Organize your recipe files by storing in Neat’s software and creating a keyword searchable digital recipe box. Document important memories such as children’s artwork, writing, and report cards. Create a digital inspiration book from magazine clippings.